The delivery of legal services is a complex process that requires a team of skilled professionals. As a result, the legal field holds many different kinds of legal career options encompassing a diverse range of skills, experience and education. 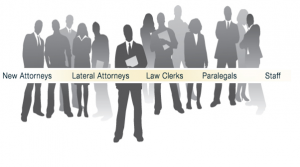 Developments in the law and technology are also creating new legal career opportunities. John Jay has an excellent resource for those interested in going to law school to become practicing lawyers, our Pre-Law Institute. If you want to become a lawyer, English is an excellent choice of major and we have several alumni currently in law school or who have recently graduated.